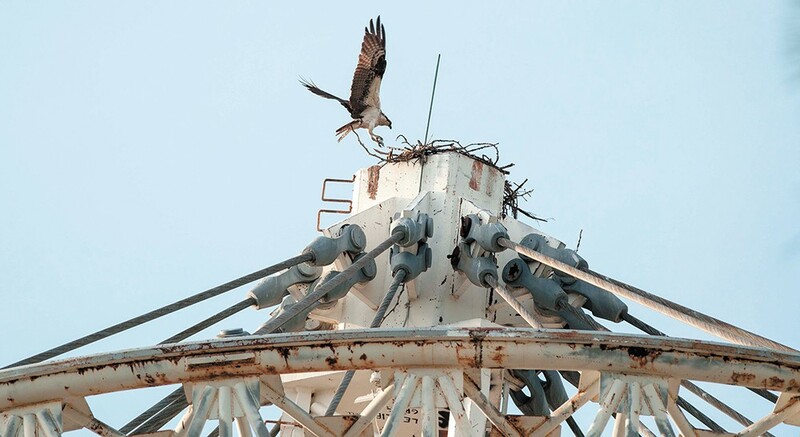 An osprey lands at the top of its nest at the Riverfront Park Pavilion. Many of the trees on the river banks — the ones across the Spokane River from the U.S. Pavilion in Riverfront Park — have an hourglass figure. Most of the way down they're your typical Spokane tree — strong, thick, tall and coniferous. But toward the bottom, at about, say, the height of a very large rodent, the trunk is bare and winnowed down to a precariously narrow width. At times it seems as if a strong breeze could topple them. And if you wait long enough, staring into the river's current, you understand why: A sleek creature — like the world's largest marmot — glides through the water effortlessly. And then the beaver waddles up slowly onto the shore, its red-orange, bark-slicing incisors gleaming in the sunlight. Water drips from its fur. It munches at some foliage floating on the bank. And then, like that, it's gone, its flat paddle of a tail the last glimpse of the beaver before it surfaces deep beneath the river water. 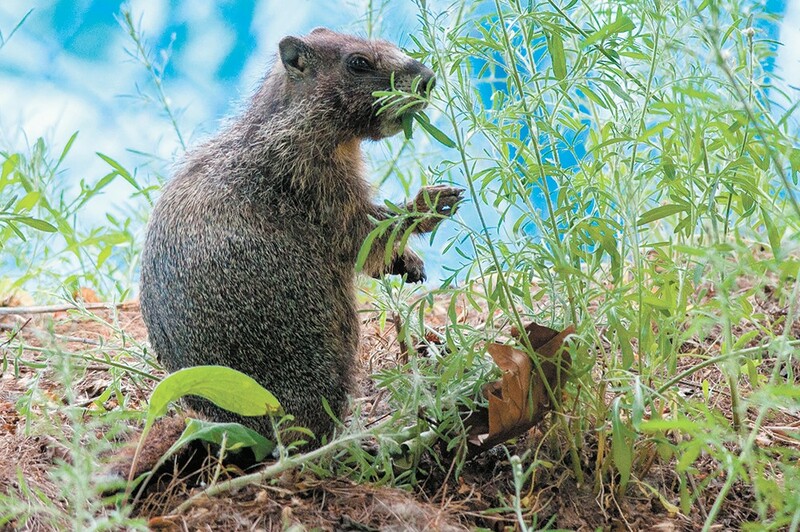 But that's not all: A nearby marmot behind the fence at Riverfront Park gnaws at some weeds and then dashes across the park's storage facility. An hour earlier, a white osprey, perched on a branch just a few yards away, and a few yards above from where the beaver surfaced, unfurls its wings and glides across the river, toward the osprey nest at the top of the U.S. Pavilion. The day before, a raccoon and her babies cross the street in Browne's Addition, the mother skulking across front lawns and manicured hedges. A few months earlier, at dusk, a family of mule deer bound on the Centennial Trail under the Monroe Street Bridge by the My Fresh Basket grocery store. This, mind you, is not the far-reaching edges of Spokane County. This is mere blocks away from City Hall in downtown Spokane. Despite all the challenges posed by development, life finds a way. And sometimes, life finds a way to irritate and frustrate humans. 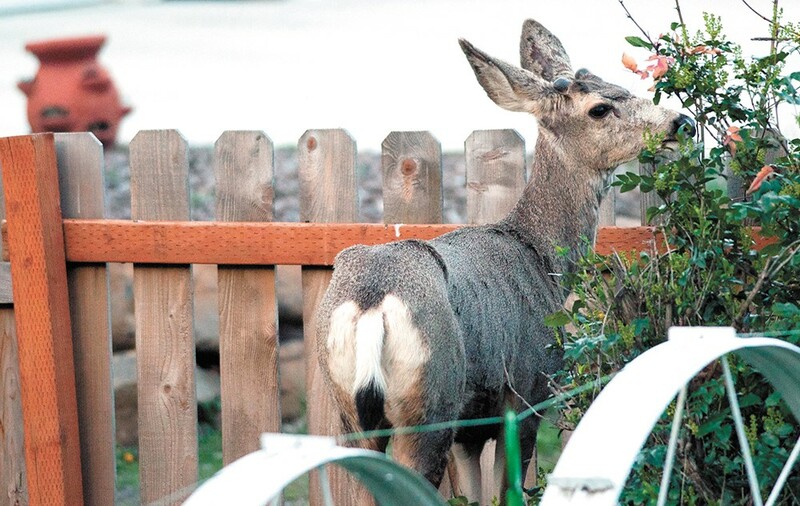 A deer munches foliage in the backyard of a Latah Valley neighborhood. One tree has already fallen victim to Spokane's relentless beaver population. You can see it if you walk near Hotel RL — the tree lying splayed down the river bank, the trunk shaved into a point like a pencil. When you've got beaver trouble, you call Joe Cannon. "A big issue this winter has been the beaver activity down there," says Cannon, a restoration biologist with the Lands Council, an environmental advocacy organization. This particular colony, he speculates, spun off from another beaver colony upstream, by the banks near the No-Li Brewhouse. When beavers are about 2 years old, they'll leave their parents' den and go out to make a living on their own. Fortunately, there's a relatively simple solution, one that doesn't require killing beavers — or even evicting them from their downtown dens: You give the trees armor. "What I'll do is take a 3- or 4-foot-tall strip of field fence — chicken wire," Cannon says. "We'll take enough to wrap it around the tree to leave an inch or two gap so that it's not restricting the tree. We'll clamp it to the ground with the cloth staples." Beavers won't gnaw through that. Cannon isn't surprised to see so many beavers near civilization. "In general I'm finding that they like being around people," Cannon says. "When you have human places developed, you don't have their key predators — cougars, wolves." By contrast, beavers don't look at humans with the same sort of life-or-death fear. "We're not part of their DNA," Cannon says. Yet humans often are a great danger to beavers. "If killing is a tool in a toolbox, people will use it when animals are impacting their lives," Cannon says. "I have to beg people to let me do something for free, like the tree wrapping down there." Fortunately, considering the value of the beaver pelt isn't quite where it was in, say, 1880, the beavers in the Inland Northwest are doing just fine. "They're rodents," Cannon says. "Rodents have a way of staying around. They can really reproduce." 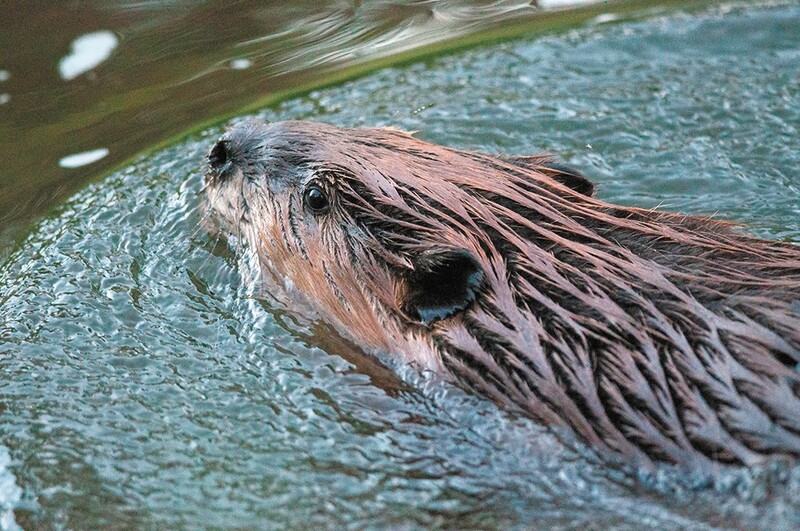 A Spokane beaver glides gracefully through the water. Then there are the marauding hordes of turkeys that have rampaged across the South Hill. "Oh, god," Madonna Luers, spokeswoman with the local office of the Washington Department Fish and Wildlife. "They're everywhere. They're on the South Hill. They're in the deep woods." Turkeys — which cameo as deadly wildlife in the latest Montana-set Far Cry game — are non-native species to the Northwest. But they've flourished in the Spokane area. "For a while, they were a curiosity. People didn't want to harm them. It's really cool, 'Look what I saw in the backyard!'" Luers says. "Then, two years later, 'Could you help me get rid of these damn things?!' Everybody loves wildlife until it becomes a problem for them." Leurs says Fish and Wildlife has struggled to control turkeys in neighborhoods. You're not allowed to discharge firearms in urban areas, and the presence of dogs and cats means that animal traps are likely to catch the wrong creature. Instead, Leurs says, staffers search for the nests and paint the turkey eggs with oil so they don't hatch. A marmot munches on some foliage on the north bank of Riverfront Park. Animals invade for a variety of reasons. The raccoons come to find hiding spots in our crawlspaces and to eat our garbage. Coyotes, Leurs says, are adaptable and opportunistic, happy to turn little Fido or Fluffy into a midnight snack. Whitetail deer come to leap our fences and munch on the roses in our gardens. The original print version of this article was headlined "Animal Invasion"